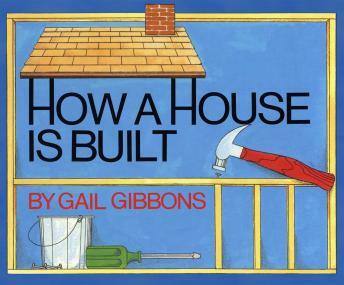 Gail Gibbons combines clear, simple wording with her signature illustrations to present all the steps involved in building a house. From the architect who draws the plans, through the various types of workers who construct it, to the family who will make the house their home, each aspect is explained with bright colors and diagrams. Children can easily follow along as construction begins at the ground level with surveyors, describing the jobs of carpenters and plumbers. The many tools used to complete each task are explained, ultimately showing how all the workers' efforts come together to build a whole house from basement to roof, both inside and outside.